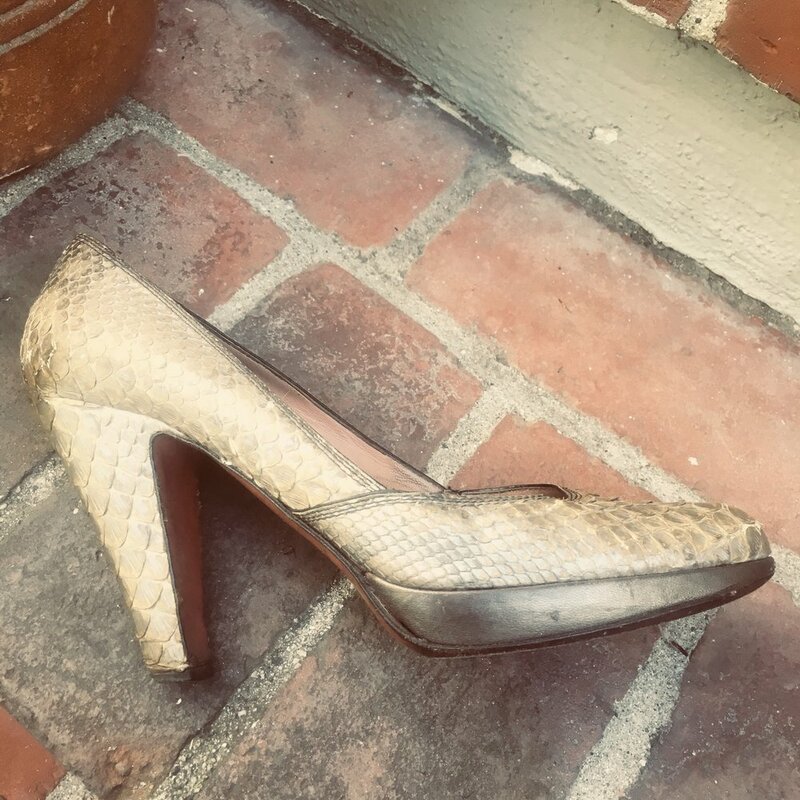 So I have a pair of Azzedine Alaïa grey python pumps that are almost destroyed now. They are chunky — but also super feminine — with a pointed toe and really cool metered toe box. ... Which means that instead of it being a platform that is the same measurement all across the bottom of the heel, it actually floats. Which is a much more feminine look as opposed to the much more clunky platform approach. It creates a very feminine and chic platform profile in the front. I really love it because it is sort of mix of "super fierce platform with thick heel that isn’t chunky" meets "ultra feminine". And the grey metallic python means that it goes with everything I could ever want to wear with it. I’ve always really loved Alaïa's collections. He alway's puts out just two kinds of shoes: platform heels and super chic ballet flats. Which is exactly what women wear. Why mess around with all of the styles in between when you can have your heels to go out and look fierce in plus the cute platforms that you need to run around town in. They’re very beautifully made in Italy — actually these are shoes that are more constructed than they are made. They feel like a car ... like a Maserati. They feel like something that has been beautifully and lovingly crafted from a very foundational level. From a wearing perspective their very fierce and big and clunky while at the same time they are very feminine and beautiful and elegant — I’ve always loved that combination — and when I combine that with how solid they are I feel like I could wear them anywhere. I’ve never had a hard time walking in them and when it comes to the concept of "shoe architecture" they are very well balanced. I still love those shoes. They’re just amazing.